Davis and the Mets have to get to their feet quickly. Nine is a pretty significant number in baseball. There are nine innings and nine men in the field during every game, so perhaps it is fitting that the Mets' season could well come down to a nine game stretch. The stretch starts Tuesday night in Washington, continues with a weekend set against the Dodgers and then wraps up with three more against the Nationals. Should the Mets continue to stumble the way they did in Atlanta, there won't be too much reason to pay attention to the 64 games left on the schedule. Even treading water might not be enough for the Mets to remain in contention. The math is pretty clear at this point. The Mets, six games behind the Nats and three games out of the Wild Card, won't have good odds of winning a berth in the playoffs if they don't start making up that ground now. Part of the reason for that is that the Mets are going to need reinforcements to go the distance. We're not talking about Jason Bay. 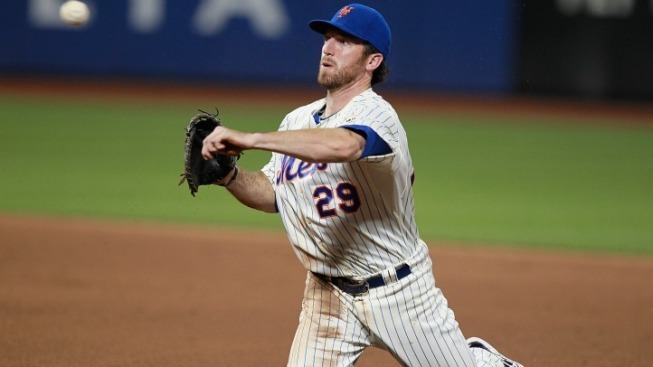 although he's expected back from his latest concussion this week and should give the Mets a bit more pop in the lineup when they are facing lefty bats. We're not sure whether or not we're talking about Matt Harvey. Harvey had a strong game for Triple-A Buffalo on Monday night, but the Mets have remained noncommittal about bringing him up to start in Dillon Gee's place on Saturday against the Dodgers. The answer to that question may come in the next three nights as the Mets try to gain some ground on the Nats and provide a reason to break the seal on one of the team's top prospects. A win behind Jon Niese would be a good way to start because a fourth straight loss would only add to the speculation that the trajectory of the season has already shifted into the wrong direction. Knowing that as soon as possible helps the Mets, but we're obviously hoping that the team has a fifth or sixth wind -- we've lost count of how many they've used -- left in their bodies. If they don't these nine games will wind up being the team's Waterloo and we can all watch the Olympics without fear of missing something significant in the Mets game.